I think I found the most enjoyable cookbook read that I've ever had. 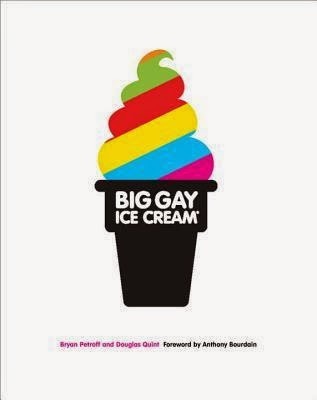 Big Gay Ice Cream is full of great stories and even better recipes. Honestly, I can't wait to get home from Phoenix so that the boys and I can start experimenting with some seriously delicious summer treats. After all, who doesn't like ice cream? Okay, I suppose some people don't, but they certainly don't live in my household! I love that this book takes you step by step, yearbook style through all the different components that go into making delicious treats. Seriously, every time I walk by this book, I find myself picking it up and reading more of it and perhaps trying not to drool as well. If you're an ice cream lover or just a lover of super fun books, I hope this one makes it to your shelf.